The Mysa thermostat is a high voltage heater thermostat. This allows it to control baseboard heaters and fan forced heaters. There are other HomeKit thermostats available for central climate control but at the time of this review none that can control high voltage heaters. The unit ships in a well-designed box that shows the unit and lists the features. 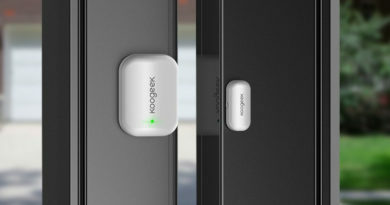 The outside advertises compatibility with HomeKit, Google Assistant, and Amazon Alexa. Inside the box is the thermostat, wire nuts, mounting screws, and an installation manual. In unboxing the Mysa, I was impressed with the build quality of it. The unit has a clean, modern appearance and feels durable. Compared to a traditional dial thermostat, the Mysa is noticeably larger. When the faceplate is removed, the size of the unit is justified by a giant heat sink for cooling the controller. 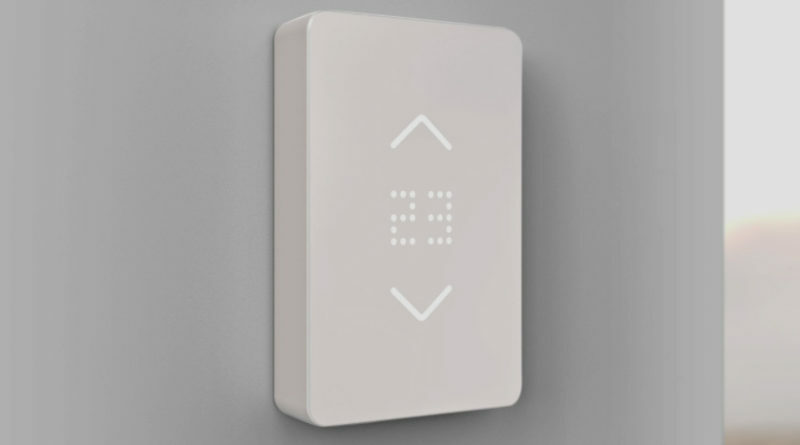 Composed of two parts, the thermostat is split between the power board – which mounts to the wall – and the faceplate, which contains controller board. The two parts are held together with a 10-pin connector and one screw. Installation is simple if you are moderately experienced in electrical work. 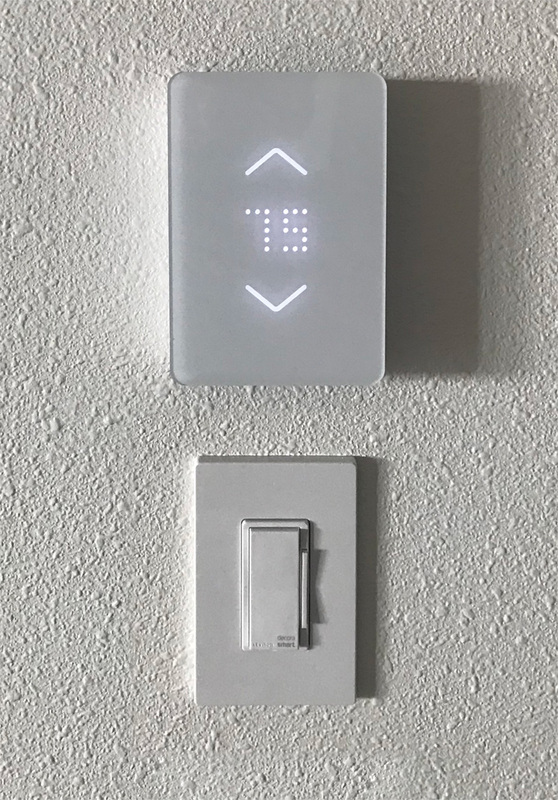 If you can install a smart switch, this install should be no problem for you. As with many other smart devices, the Mysa requires a neutral wire so you will want to verify you have this available before purchase. The instruction manual in the box covers the basic install and has clear steps and diagrams. An install video is also available on YouTube. The inclusion of mounting screws and wire nuts is a nice touch. The initial install follows the standard procedure for adding a HomeKit device; The iOS Mysa app does require creating a Mysa account. One hiccup I experienced during setup was after the device was joined to the network it was unusable for a few minutes. The screen showed a spinning circle icon and it appeared to be performing a firmware update. The Mysa app allows you to manually adjust temperature, view current temperature/humidity, set schedules, and create zones. It also lets you set display brightness, select Fahrenheit or Celsius, heater type, and several other settings. Schedules for controlling temperature for days of the week and time can be set manually or through a wizard. Overall the app is simple and easy to use. Two devices are presented to the Apple HomeKit app. The thermostat display shows as a dimmable light and the thermostat shows as a thermostat. These devices can be individually controlled and also included in HomeKit automations. 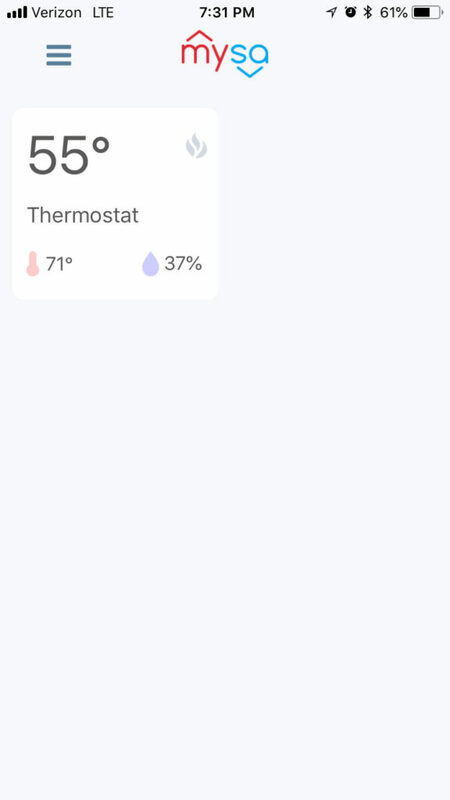 The HomeKit homepage shows the current temperature and set point in the status section. 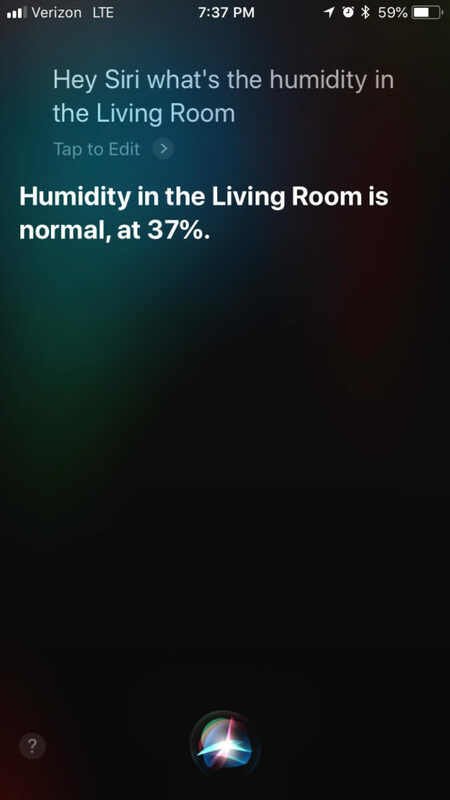 Siri commands can be used to adjust the thermostat set point or to query current temperature/humidity. 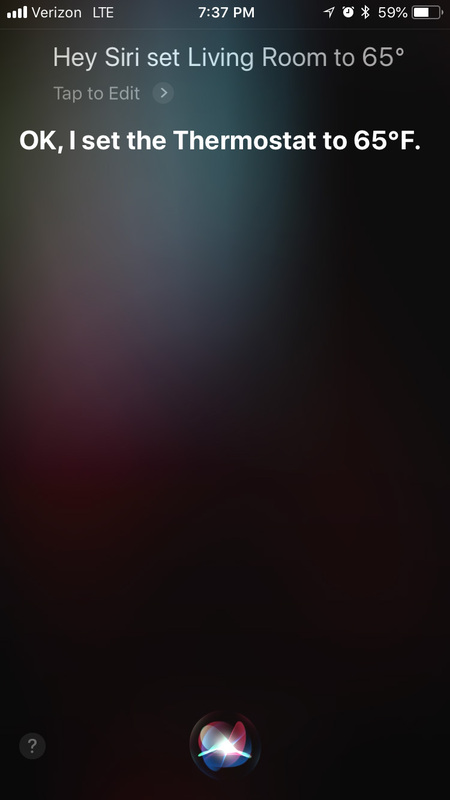 These commands work without issue and Siri responds quickly. The thermostat is also adjustable without launching an app by pressing the up or down arrow on the faceplate. Using the faceplate buttons requires significantly more force than other touch displays. A recent firmware update helped with this issue but it’s still not great. I received this product at the start of summer and have not had a chance to run it through the cold weather my region experiences in the fall and winter. Even during the summer, it is nice to have a temperature display on the wall and on your phone. On a recent cold weekend my house fell to 60 degrees and I set the thermostat to 68 degrees. The thermostat reached the set temperature and held it with great stability. The unit uses a PID for temperature control which means that it learns how often it needs to run to reach the set temperature for your room. This is significantly smarter than a traditional ON/OFF thermostat which tend to overshoot temperatures. Mysa can work with other smart home systems including Amazon Alexa, Google Assistant, and IFTTT. I only use HomeKit so I did not test functionality with these other systems. 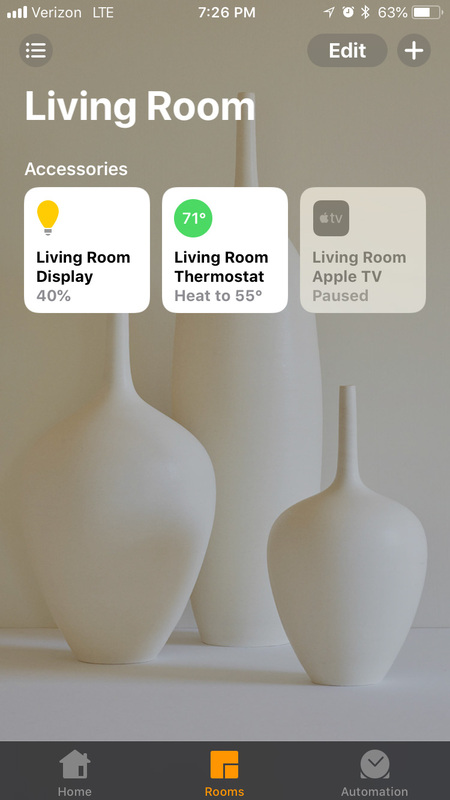 Currently Mysa is the only available HomeKit compatible line voltage thermostat. Good build quality and appearance. Company is actively releasing updates and new functionality. 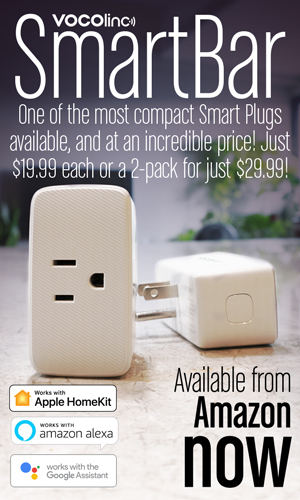 Compatible with other smart home systems such as Google and Amazon. 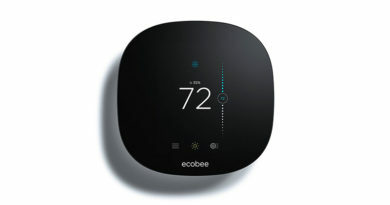 Expensive, at $125 this is over twice the cost of a standard programmable thermostat. This can add up quickly if you want to have thermostats in multiple rooms. 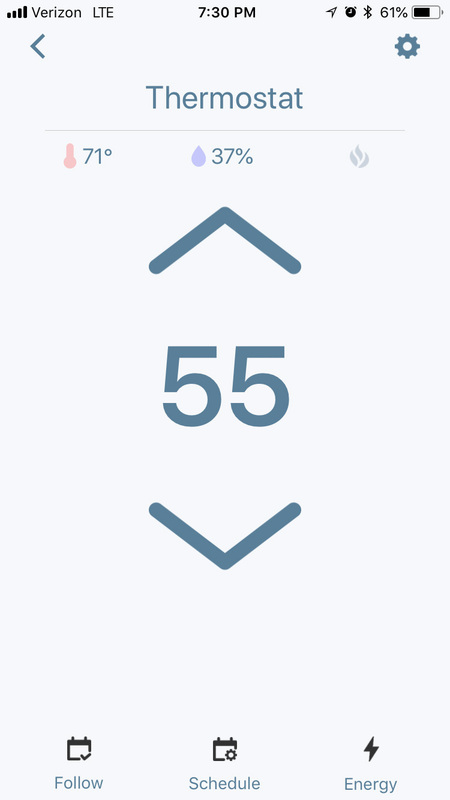 Touch buttons are not as responsive as they could be. Unit is currently only for direct purchase and there is a significant wait time before shipment. Overall, I have been very impressed with the Mysa unit. I plan on buying one for my bedroom to supplement the unit in the living room. I would recommend it to anyone looking to add smart home functionality to their high voltage heating system. I also purchased and installed one. There are a lot of homes with line level thermostats (120/220 volts AC) in the Pacific Northwest, specifically the Seattle and Puget Sound area. My installation is with a 220 VAC forced air heater in my lower entry. No neutral wire. Just two 110 VAC lines that add up to 220 VAC. There is a ground wire but that is not the same as a neutral wire. With a 120 VAC system a neutral wire is required. Had some trouble adding to Homekit but after several tries we got it. Also, touch sensitive buttons were not very responsive without pressing hard on unit. Mysa staff seems to know this and has just pushed one of two firmware updates to the unit to address touch screen sensitivity issues and WiFi connectivity issues. As long as the unit is connected firmware updates are automatic as far as I can tell. The latest is version 1.17 and my unit has it with no intervention from me. The next firmware update is supposed to further improve touch screen sensitivity. I like that the Mysa connects with Homekit through wifi instead of bluetooth because wifi has better range. After the firmware 1.17 update the connection to Homekit has been more reliable. I haven’t seen a “No Response” message since the update. The other issue I see is the duty cycle for the forced air heater which cycles on and off frequently. Optimally I would like to see the heater come on and stay on until the selected temperature is reached instead of continuously cycling. The last firmware update to 1.17 addressed this, but I have not gotten a chance to check it. Duty cycle is supposed to extend to four minutes. I’m not sure why there is a duty cycle unless it’s for cooling periods for the Mysa unit. One of the reasons the unit is so large is because of the heat sink installed. It has to be a large heat sink in order to be effective. This is necessary when controlling line level voltage. Overall, I like this unit. 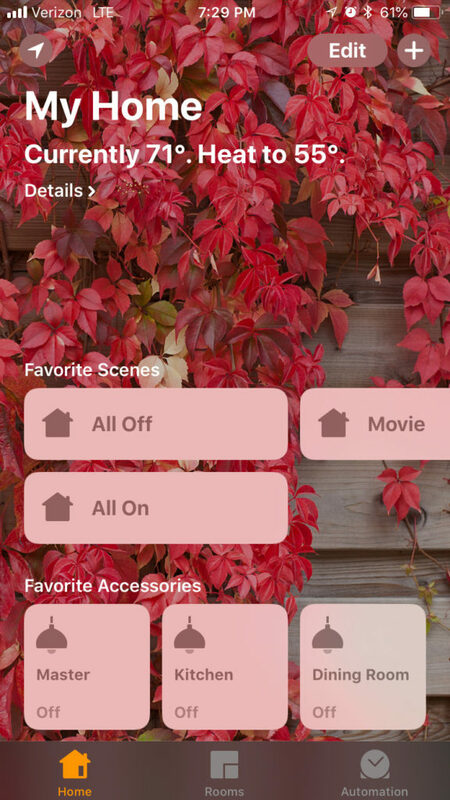 It follows Apple’s minimalistic philosophy on the unit itself with very simplistic local control, but there is much more functionality with the Mysa app and Homekit. thanks for the feedback Bart, I’m sure anyone reading the article and your subsequent comments will be of help. Hi Simon! Thank you for the great review of Mysa. I’ve been in the process of installing numerous home automation devices in my latest home. I have a laundry list of different products that I’m trying. I’ve always been into home automation starting with the X10 products back in the 1980s. 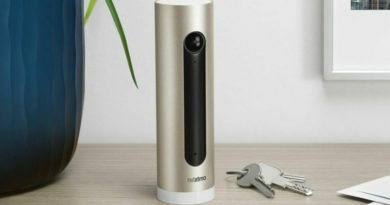 I’ve designed several hybrid security systems for both home and automotive applications. For awhile, I installed security systems and low voltage professionally in Phoenix for some extra cash working for Bolt Home Systems. Not my primary employment. My latest security system is simply the new Nest system. No effort there but it seems to work fairly well. It’s outside the Homekit ecosystem which is a negative for me. I may change to a different system at some point. I have extensive technical skills so most of the home improvement/modification/automation work is pretty easy for me. I’m a FAA certified Airframe and Power Plant Mechanic and a FCC licensed General Radio Operator. Most of my experience there is from flying and fixing aircraft for twenty years in the Navy. My rating was Aviation Electrician’s Mate and I flew as a flight engineer for my last 17 years. The first three was missions systems operation and repair. The point of that is that we often have to figure things out on the fly and that experience helps greatly in figuring out home automation and other technical elements. Finding this web site last month was like a holiday for me. I love all the reviews and check the web site daily for new information. 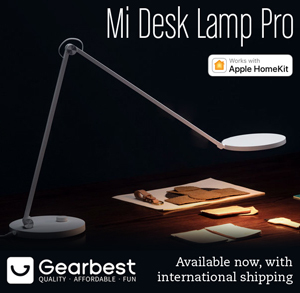 I read several of your other reviews and have some comments on Caseta, iDevices, Elgato, Fibaro, Koogeek, Lifx, Hue, and a few others. I have all of those devices installed. Some of those required some effort to get to work properly. Some are still a little glitchy, but I’ve created some work arounds. I look forward to reading more and also learning more. You folks have taught me a few techniques that have helped. Learning new things is the greatest benefit I’ve found here. It’s great to share information with like minded people. Hi Bart, thanks. I can’t take personal credit for the review, but I’ll let the reviewer know that’s it’s proving popular. I’m impressed with your list of skills. The only ‘strings to my bow’, as it were, are being a musician and graphic designer, but getting the website up and running is an achievement too! Glad you like the site, I’m trying to get the word out, and I know that people in the HomeKit community are hungry for as much info as they can find, so I hope I’m helping with that. From my understanding, the duty cycle for the forced air heaters is to conserve energy and comes from our PID control. The new cycle lengths will help with both conservation and optimization. That new firmware update fixes an absolute ton of things besides that as well. Hi Brad, welcome to the site. Your product is clearly very popular! We’ve not received this much feedback on any other product/review. Thanks, and we’re ecstatic to hear that. Our goal is to help people save energy with smart tech, and it has definitely been working so far. If you have any more questions feel free to ask me here or get in touch with our customer service team! Hi Brad! Thank you for the reply! Obviously I installed my Mysa just in time for summer! So I can see the temperature remotely but I’m probably not going to turn on the heat until September. So my experience thus far has been to monitor the temperature in my entryway using Homekit. After firmware update 1.17, the connection has been much better. I don’t think I’ve seen a “Not Responding” message in some time. I also love that you chose a wifi connection instead of a Bluetooth connection. Wifi is definitely more reliable at the distances from hubs (Router or Apple TV/iPad/Homepod) usually associated with most homes. Bluetooth devices in my entryway sometimes have issues staying connected to Homekit. Such was the case with a Schlage Sense lock and an iDevices wall switch. These were also in my entryway and would often disconnect from Homekit. So kudos for choosing wifi! As far as duty cycles go, not sure that stopping and starting a fan is energy efficient. Electric motors consume more electricity to start up then they do to just keep running. It is almost always more efficient to keep an electric motor running until it reaches it’s desired state. In the case of a heater, the desired state is the desired temperature. So please correct me if I’m wrong there. For baseboard heating using a duty cycle may be more energy efficient. A heating element does not have a significant startup current draw like an electric motor. Starting and stopping should not cause any additional current draw. I’m not sure what your reference to PID means. That’s a valid point about the startup energy use of fan-forced heaters. While we’re cognizant of the changes, we think there’s a lot more to be gained from maintaining a steady setpoint than overshooting and then adjusting. Our heating algorithms are built to keep as close to a setpoint as possible by using duty cycles. You’re right; the application of duty cycles is more evident in baseboard heaters. But we’re constantly refining the best way to operate fan forced heaters (hence the update), and so far this seems to be the most efficient way. If our data and research show that more electricity is being wasted on average, we’ll definitely rethink our methods as our main goal is to offer energy savings with smart tech through precision. And we totally agree with the WiFi point! Using something that’s in virtually every house was a no-brainer for us, considering we want to make Mysa as friendly as possible for people to use. We see smart tech as a gateway to save energy, and muddling it up with hubs and whatnot didn’t make much sense. Hopefully that helps and thanks for the discussion! Brad, I saw this post while searching for a Mysa thermostat for a heat pump system, like the one I have in Scottsdale, AZ. Where can I get one in St Louis MO, since I know they exist? I love the look and functionality of the Mysa and wish to standardize at both locations. Mysa has produced a quality unit which while requiring oversized (for a thermostat) dimensions to accommodate the line voltage heatsink still presents neat and simple elegance with a white on white display with the temperature and up/down arrows. I have 10 of these units controlling resistive 220v heaters, No problems encountered to date and while I too have not worked them in Winter this Spring has been cool enough to exercise the cycling and scheduling aspects. The app is a breeze and for anyone who has tried to program a thermostat will actually encourage you to use it to conserve heat and power. While I purchased these units to have remote control of my vacation home heat I have been encouraged while living with them this summer to optimize my use of heat. The incremental control of each heat cycle provides more constant and consistent heat and should also conserve power. The included power monitoring feature (not yet implemented) for each unit should help with heat scheduling and smart features in the programming of the units monitoring each thermostat should ultimately save power and thus pay for the cost of the unit. Support has been responsive and helpful in the few questions I have asked. All in after only a few weeks I am enthused with the design, operation and potential of this innovative product. I replaced existing programmable thermostats with MYSA and would encourage all to do the same bringing your home to automation with practical and potentially cost saving state of the art control. Thanks for the additional feedback Eric, this has certainly been one of the most popular reviews we’ve done so far, so I’m guessing people are really interested in this device. Where I live they don’t have heating as such, so I’m unable to explore the wonders of such a piece of equipment! Thanks for the feedback Andrew, your comment really reflects how so many other people are happy with this product. Thanks so much for the love, Andrew! Thanks for this review. @Brad: I currently have an extensive openHAB system running things in my house and I’m on the hunt for a smart thermostat to manage my forced-air in-wall heaters. Mysa looks like a great fit, except that I don’t see any options for integrating it yet. Is there an API I could develop against? Thanks. No, not as of right now. An open API has been discussed before, but nothing is concretely in the plans as of yet. We do integrate with a bunch of other platforms, so maybe IFTTT or Smart Things would suffice for now. I’m considering purchasing 9 of these for the new home I just purchased (to replace old dial thermostats from probably the 80’s). Have you considered the risk if the company goes under? I contacted their customer service to see if they had any plans in that event to outsource the code so people could build their own servers, or at least push an update to allow more local control. The only feedback they had was if they go out of business then they all become regular old dumb thermostats. Do you know how solid financially their company is? I would hate to invest over a grand in this and be stuck with just regular thermostats. Hi Emmanuel, thanks for the message. Honestly, it hadn’t occurred to me about the possibility of a company going under, but I guess that could happen to almost any company in this day and age, so I tend not to think about it too much, otherwise I’d probably buy nothing. Having said that, if you’re investing a lot of money into these kinds of devices, it’s always a good idea to reach out to a company, just to get a feel for how well they communicate with customers. To me, the kind of response you get, then determines whether I feel I could trust a company or not. Mysa have been quite active in the comments about this review, so they definitely seem like they’re paying attention, and I think that’s a great thing. So I took the dive and ordered the 9 thermostats 3 days ago and they will hopefully ship soon. I’m happy to support fellow canucks and hopefully they are around for the long term. The fact they have been active here is a nice sign that they care about their customer’s happiness. I’ll post back one all is set-up. Thanks again for the great review. I do hope everything goes well, and I’m sure if you encounter any glitches or just have questions, the guys at Mysa will be on hand to help. Let me know how you get on, and maybe we can do a post about your experience. My wife and I have just recently sold our home (all the kids are gone) and have purchased a fairly new townhouse in the same area (Greater Vancouver). Our new townhouse has baseboard heating throughout with typical wall thermostats. This product, Mysa thermost, seems like it may work with our heating needs. However, one of my concerns is whether the neutral wire is required for each Mysa thermostat to become wifi compatible? There are 4 wires on the rear of the thermostat; Green-ground, White-neutral, Red-power and Black-power. I’m not sure yet, but besides the power (x2), is a neutral (white) required in each box? 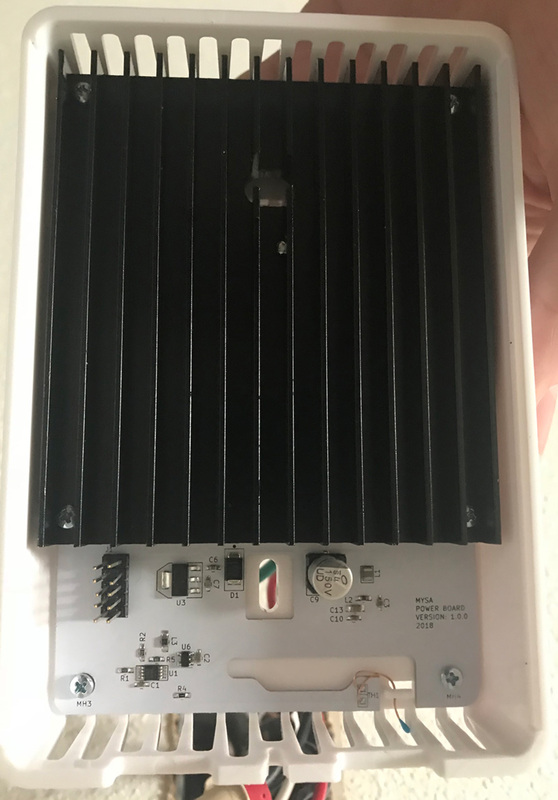 There may be a simple connection available for two wire (120-240v) but I’m just wondering if a separate neutral is required in the box for the wireless system to work with Alexa or Google? We plan on wiring our new home as a smart home. This includes a Sonos speaker system w/Alexa, Nest smoke detectors, Nest door bell/camera, Yale door lock w/wifi, Garage door opener, wifi light switches and a baseboard heater control system such as Mysa thermostats. glad you like the review. I wasn’t the reviewer in this case, so I can’t really answer your question, but if you email bradley@getmysa.com, he’ll definitely be able to answer your question, if he doesn’t in fact reply here first! Let me know if you have any problems contacting them, and I’ll see if I can help. In conventional 240v heating only red and black wires with a ground (bare) will be present in a thermostat box. There are normally 2 pairs of these, one pair coming from the electrical service and one pair leading to the heater. It is important to note that a thermostat can be wired to a heater using only one pair in which case the service feed would be at the heater. 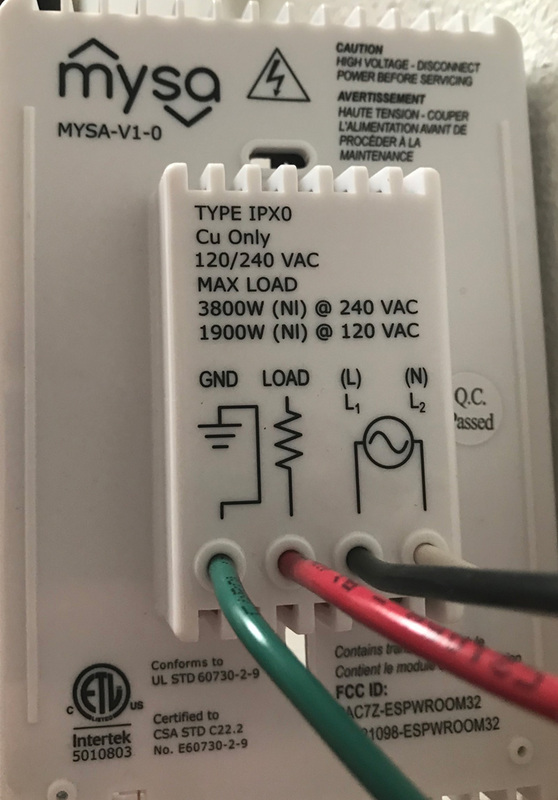 In this latter case the MYSA will not work because one phase of the circuit would not be available in the thermostat box. In the former case where 2 pairs are available the white and black MYSA wire would connect to the service feed pair white MYSA to black feed, black MYSA to red feed, the green to the box neutral and the remaining red MYSA wire to the red wire of the heater service. The circuit is completed by connecting the black heater service wire to the black service feed wire (already connected to the MYSA white wire) with a suitable wire nut. Conventional 120v systems typically only have white/black pairs where the white serves as a neutral. The MYSA will work equally well with those circuits as long as the service feed is available in the thermostat box. Hope this is helpful. Yes, your comment was helpful and it’s what I suspected. I don’t have access to the new town house for a few more weeks. I’ll look at the wiring configuration at that time. Hopefully a neutral is available in the wall box for each baseboard heater. Do not expect either the black or red wire to be neutral if the wiring is done correctly. Doing so could be DEADLY on a charged circuit. Both the red and black should carry 120v with respect to neutral (the box ground or bare wire) and 220v with respect to each other. Just received my first Mysa Thermostat and installed it with ease in my Condo in Vancouver. Very impressed so I have ordered a second one. 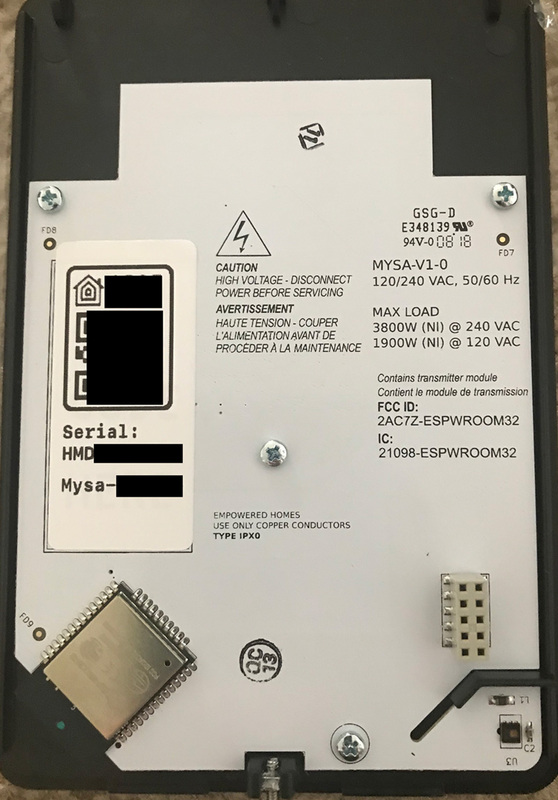 I was a little puzzled at first because when installing I discovered that like most Condos I run on 208V. not 240V. The Mysa support team assured me that anything from 120V to 240V will not be a problem. This appears to be so. After much searching for an Operator’s Manual on the web I would like to suggest that the guys at Mysa make one available explaining all the features and symbols. If I install 2 of these at my cabin that has high speed internet, Will I be able to turn the heaters on remotely before I arrive? Yes plus monitor cabin temperature in each of the two locations even if the thermostats are turned off (not turned off at the breaker).